Ellicottville, NY is a holiday heaven, attracting a large number of tourists with a lot to offer in every season. The village is as much fun in the winters as the summers. It gets abundant snow and there is always an air of festivity about the entire place, especially in the holiday season. Ellicottville has something for everyone; fun, adventure and cosiness at the same time. If you are planning to go on a vacation this winter, this might just be your place to be and have the time of your life. We have a step by step guide for you so that you plan ahead and enjoy to the fullest. The village hosts a number of winter festivals. One of the most attended one is the ‘Walking in a Winter Wonderland’ which starts at the end of November. The whole village is lit with Christmas lights with the smell of chocolate and baking in the air. Christmas carols fill the air with tourists taking a stroll amid all this. Another festival is the annual beer and wine festival where tourists get to taste a large variety of drinks and share in the festivity. The trip to the village is incomplete without a try at skiing. Ellicottville is known for its snow adventures, especially skiing. 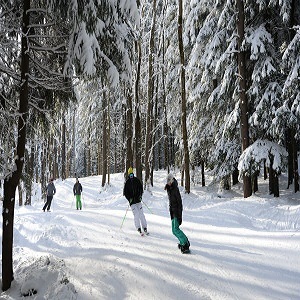 It is home to two ski resorts, HoliMont Ski Area and the more famous Holiday Valley Ski Resort. These resorts not only offer an opportunity to skiing, cross-country skiing, snowshoeing, snowmobiling but also offer ski lessons for all ages. They are open on weekends. Take a stroll around the village. It is one of its type, with a several gift shops to take back home for friends and family. The art galleries there are worth a shot in any season, featuring work of artists from all over the country. You can also get a massage at the end of an adventurous day at the Tamarack club spa where every strain is guaranteed to drain off. Dining at the village will introduce you to new flavours and cuisines. The Ellicottville Brewing Company is a unique place to experience. The restaurant offers drinks that are brewed on site in front of the customers. John Harvard’s in the Tamarack club is another dine out you should not miss out on. Gin Mill offers a bar and entertainment lounge with live music. You can let go of the kids in the games room.